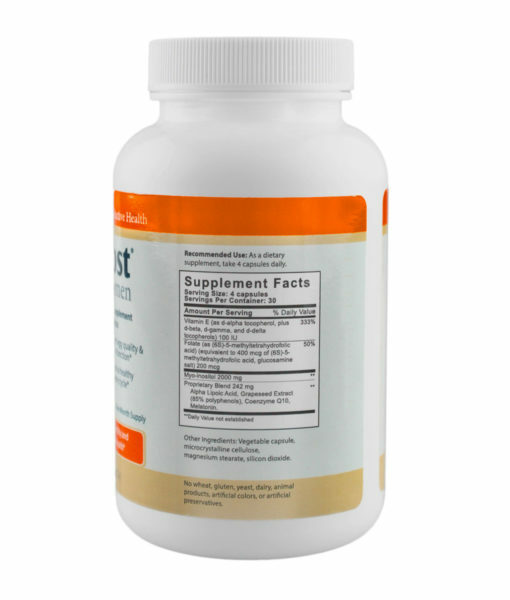 Myo-Inositol – a B-vitamin-like nutrient that is a needed by the body for insulin signaling. 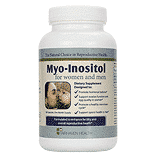 Myo-inositol also increases the insulin sensitivity of cells. 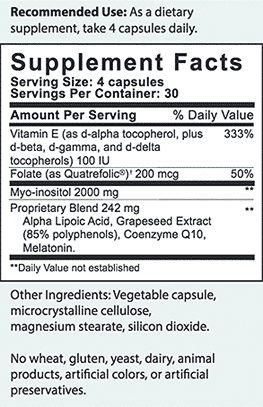 OvaBoost contains 2 grams of myo-inositol. Melatonin – often used at higher dosages (7-10 mg) to help with sleep, melatonin is an antioxidant that occurs naturally in the body. 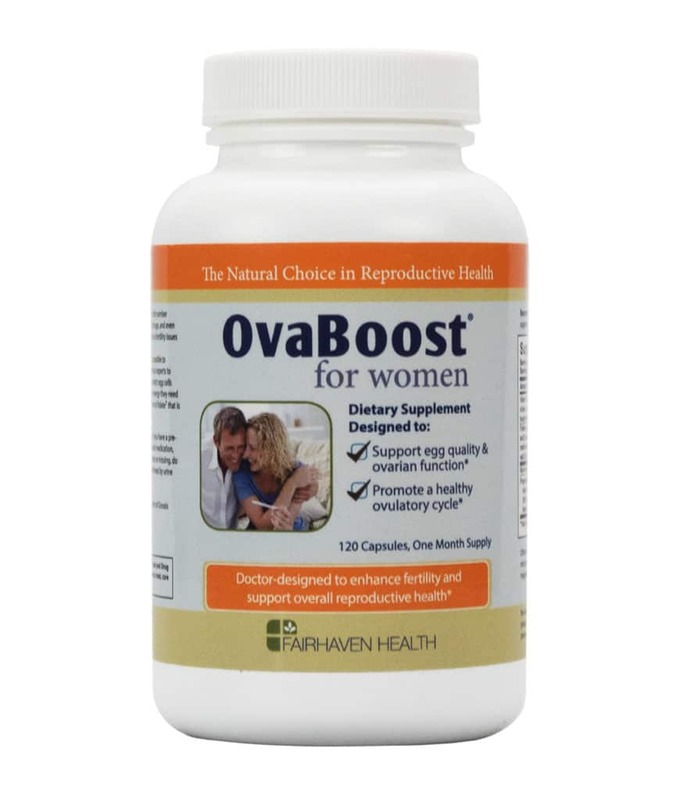 OvaBoost contains 2 mg of melatonin which has been shown in studies to significantly decrease testosterone, increase follicle-stimulating hormone (FSH), enhance progesterone production in the follicle during ovulation, and improve menstrual regularity. 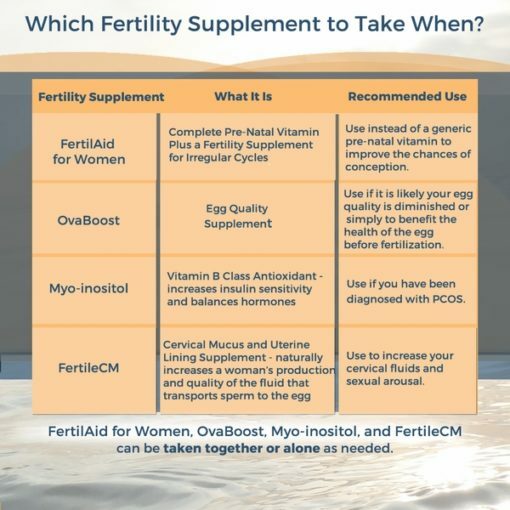 The Trio of Myo-Inositol, Folate, and Melatonin – recent research in women undergoing IVF treatments indicates that this trio significantly improves egg quality. Vitamin E, Grapeseed Extract, and Alpha Lipoic Acid – antioxidants to remove free-radicals before they can harm your eggs. CoQ10 – important for energy production in the mitochondria. It’s a fact – women who know when they ovulate are much more likely to get pregnant. For many women, knowing when, or even if, they are ovulating can be very challenging. Hormonal imbalance and insulin resistance are determining factors in whether a woman can ovulate consistently and on a predictable schedule. The common thread between hormonal imbalance, insulin resistance, and ovarian cysts is insulin. So what does insulin have to do with fertility? Insulin can be thought of as the super traffic cop hormone. The health and function of the body depends on whether it and many other hormones stay organized, efficient, and balanced. Excess insulin has a cascading effect on other hormones. It can cause an increase in testosterone levels which can completely halt ovulation in a woman. Follicle Stimulating Hormones (FSH), Luteinizing Hormones (LH), Estrogen, and Progesterone all fall out of optimal levels when there is too much insulin. 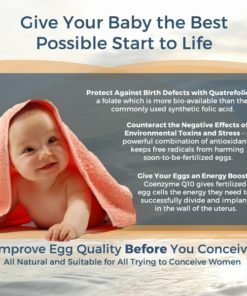 If a woman can ovulate in spite of all these hormonal imbalances, the quality of the egg released is frequently low which makes conception much more difficult. 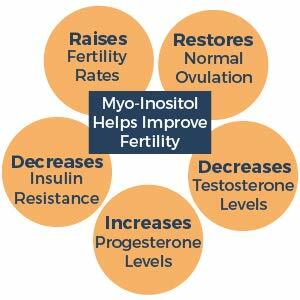 Myo-Inositol, a key ingredient in OvaBoost, has been studied extensively and found to play an important role in improving ovulation and overall fertility in women who are having issues related to insulin. 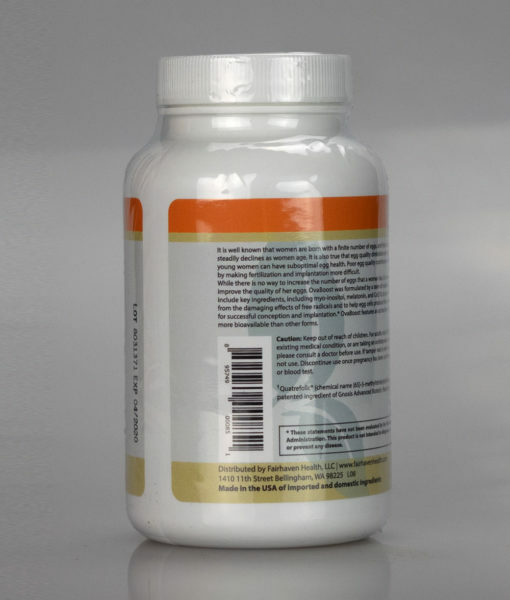 Myo-Inositol is a vitamin-like substance that is widely accepted as part of the B family and commonly referred to as Vitamin B8. It is made naturally in the body and one of its important functions is to ensure that signals from the brain concerning insulin levels reach their respective receptors and bind to them. Additionally, a lack of myo-inositol can impact the ability of the cells to be sensitive to insulin. Supplying extra myo-inositol to women with hormonal imbalance, insulin resistance, or ovarian cysts helps correct the malfunctioning insulin pathways and reduce the signs and symptoms of insulin resistance. Melatonin, another key ingredient in OvaBoost, is a great complement to myo-inositol. 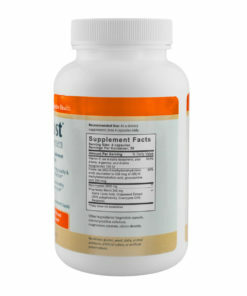 While myo-inositol works to correct the root cause of insulin management issues, melatonin has been clinically shown to significantly decrease testosterone, increase follicle-stimulating hormone (FSH), enhance progesterone production in the follicle during ovulation, and improve menstrual regularity. When we talk about egg quality, we are referring to the percentage of total number of eggs that are considered normal. Given that a woman’s supply of eggs is finite and cannot be increased, the percentage of eggs that stay healthy and normal is critical. Each cycle, a woman’s available eggs enter the “egg lottery” to see which egg will be the chosen one that cycle. 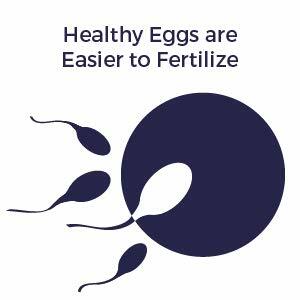 If an abnormal quality egg gets selected, the chances for a successful pregnancy that month go to near zero. Even if the egg manages to get fertilized, the chances of miscarriage are very high. Once an egg in the reserve becomes abnormal, it can never become normal again. There are lots of things that happen to our fragile eggs as we age. Most are unavoidable – fevers, stress, toxins, free radicals, and infections to name a few. The impact of a woman’s age on her egg quality is, unfortunately, quite predictable. By the time a woman is in her mid to late 30s, she will have more abnormal eggs in her reserve than normal eggs. The OvaBoost formula is designed to improve egg quality using a two pronged approach. OvaBoost contains not only the proven trio of myo-inositol, folate, and melatonin but also an impressive spectrum of antioxidants to mitigate the effects of free radicals on eggs being stored in the ovarian reserve. 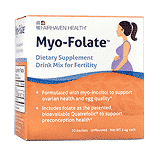 Contains Active Folate Especially Important for Those with MTHFR Mutation. Up to a whopping 60% of the population have a defect in their MTHFR gene which prevents the body from converting folic acid to active methylfolate. Most people have no way of knowing if they are absorbing their B Vitamins or are being blocked by the MTHFR gene defect. 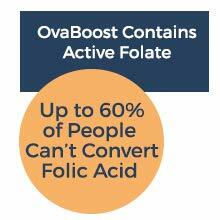 Choosing folate over folic acid ensures that you will be able to absorb this critical vitamin. Key Ingredients Do Double Duty. You might have noticed that key ingredients in OvaBoost such as myo-inositol and melatonin play important roles in both insulin regulation as well as egg quality. Even if your primary goal is to work on one or the other issue, working secondarily on your body’s insulin management or ability to fight free radicals can benefit not only your fertility but many aspects of your overall health. contains the “Magic Trio” of myo-inositol, folate, and melatonin which have been clinically proven to work synergistically with each other. In this case, 1 + 1 + 1 equals more than 3.
delivers 2 grams of Myo-Inositol which works to treat insulin mismanagement issues. offers a powerful dose of antioxidants to prevent oxidative stress that can push normal eggs into the abnormal range. Consider our Premium, Clinical Grade Fertility Solution if You Need a Complete Fertility Solution that Contains No Herbs. If you are pursuing ART/IVF, your doctors will request you avoid herbs, which work in similar fashion to the medications they will prescribe. 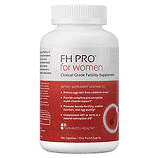 FH PRO for Women is recommended by fertility clinics as an herb-free alternative to the TTC Boost Bundle. I Have Insulin Resistance. Will OvaBoost Help Me? Some women (i.e. with ovarian cysts) have insulin resistance which means the cells in your body are not very sensitive to insulin. When your cells are resistant to insulin, you tend to have higher than normal levels of insulin circulating in your bloodstream, causing higher than normal levels of testosterone, which in turn can interfere with ovulation and menstruation. 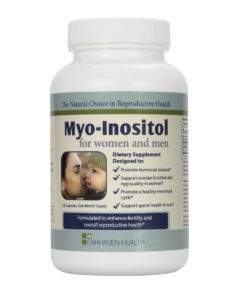 By supplementing with myo-inositol, a key ingredient in OvaBoost, insulin sensitivity is improved, hormone balance is restored, and fertility is increased. How Can I Tell if My Egg Quality is Low? There is a known, direct correlation between age and egg quality so if you are over 30 years old, your egg quality has diminished. If you have been diagnosed with PCOS, your egg quality is more likely to be sub-optimal. Another way to assess the quality of your eggs is to test your FSH (follicle stimulating hormone) levels. 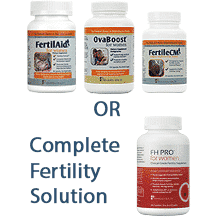 Higher than normal levels of FSH can suggest a fertility issue, such as diminished ovarian reserve or low egg quality. If you know or suspect poor egg quality, it is important to do what you can to boost it. 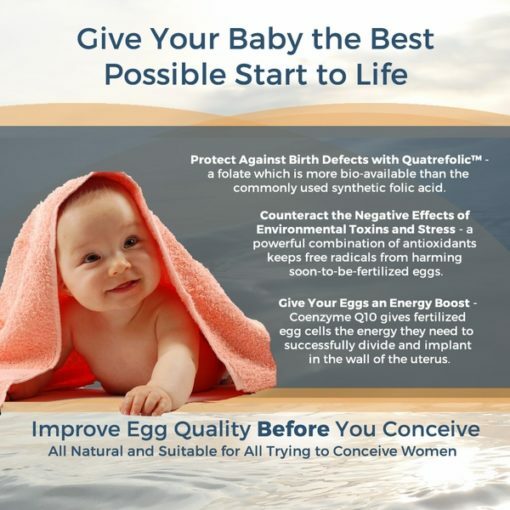 Low egg quality means the sperm will have difficulty penetrating the egg for fertilization, implantation is less likely to be successful, and the chance of miscarriage increases due to genetic abnormalities. I Read Alot About Melatonin. What Do I Need to Know About It? You may be most familiar with melatonin as a natural sleep aid. OvaBoost contains a small amount of melatonin (2 mg), the same amount given in separate clinical trials for improving egg quality and regulating ovulation cycles. 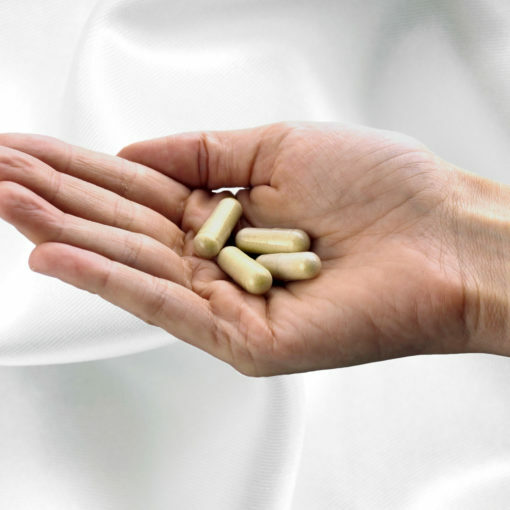 When taken in the recommended manner (4 capsules per day in divided doses), we do not expect OvaBoost to impact your sleep cycle, or your day time energy levels or alertness. However, if you notice a change in your alertness or energy level, we recommend taking the all four capsules just before bed time. How Quickly Will OvaBoost Work? The ingredients in OvaBoost will begin to work immediately to improve egg quality and ovarian function. And, while results may vary from one woman to the next, we expect to see improvements in egg quality, ovarian function, and cycle regularity within 3 months. 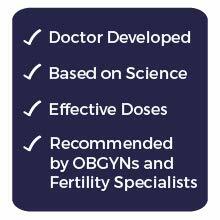 We recommend taking OvaBoost for a minimum of 3 months, or as long as you are actively trying to conceive. 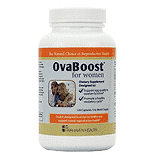 OvaBoost can be discontinued once pregnancy has been confirmed. OvaBoost has no known side effects. However, as with any dietary supplement, if you have a pre-existing medical condition, we recommend that you discuss taking OvaBoost with your doctor. Please consult with your physician before taking OvaBoost if you have been prescribed a medication for depression or anxiety, or if you are taking the herb St. John’s Wort, as large amounts of myo-inositol may have additive effects when taken along with drugs and herbs classified as selective serotonin reuptake inhibitors (SSRI) and selective serotonin norepinephrine reuptake inhibitors (SNRI). What is the recommended dosage of OvaBoost? 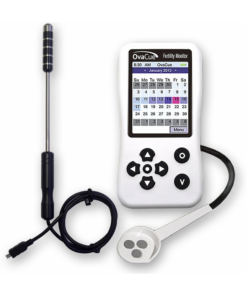 You can begin taking OvaBoost at any point in your cycle – no need to wait for a specific time. 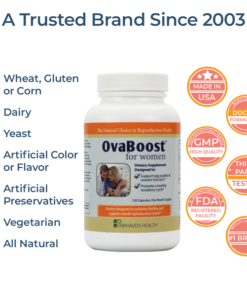 Each bottle of OvaBoost contains 120 capsules, a one-month supply. We recommend taking 4 capsules each day in divided dosages with food. 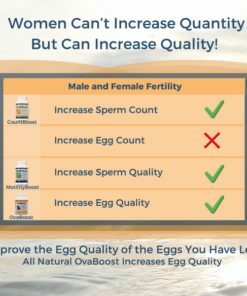 How long will it take to experience the benefits of OvaBoost? The ingredients in OvaBoost will begin to work immediately to improve egg quality and ovarian function. And, while results may vary from one woman to the next, we expect to see improvements in egg quality, ovarian function, and cycle regularity within 3 months. OvaBoost can be discontinued once pregnancy has been confirmed. 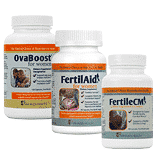 Can I take OvaBoost with other Fairhaven Health supplements? 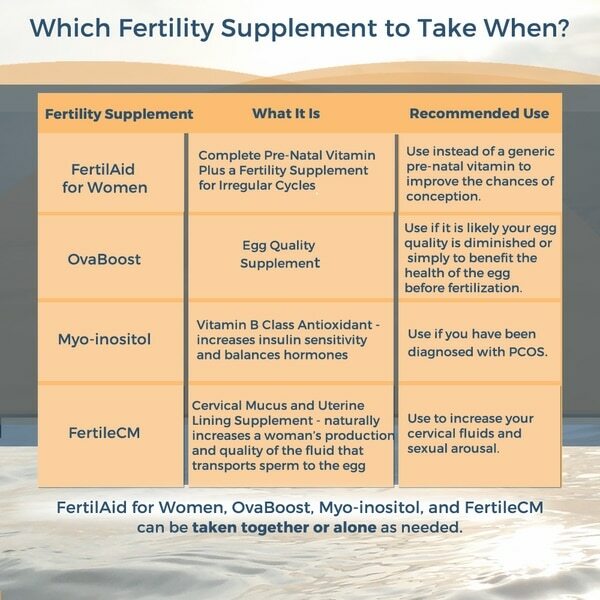 Yes, please review our Fertility Supplement Guide. 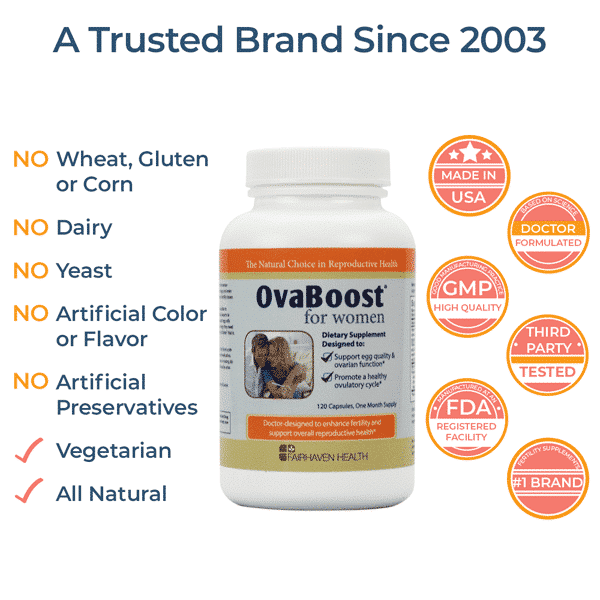 Can I take OvaBoost while I am pregnant or breastfeeding? Because the ingredients in OvaBoost are intended to increase fertility and to aid conception and are not required during pregnancy or lactation, we do not recommend that you take OvaBoost during pregnancy or while you are breastfeeding. Once pregnancy is confirmed with a urine or blood test, we recommend discontinuing OvaBoost. 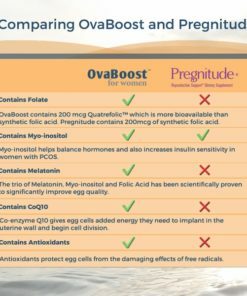 Does OvaBoost contain a prenatal? No, it does not. 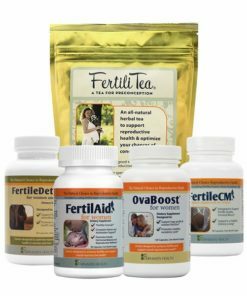 We recommend that you also take a dietary supplement that contains prenatal vitamin support, such as FertilAid for Women or PeaPod Prenatal. I notice that OvaBoost contains melatonin. Will this product impact my typical sleep pattern? 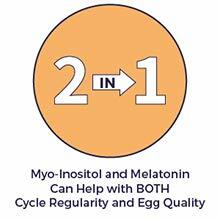 Melatonin is a powerful antioxidant compound that has been shown to be helpful for improving egg quality, especially when given in combination with folic acid and myo-inositol. In addition, melatonin is a frequently recommended natural ingredient for helping to restore normal sleep cycles in people with insomnia. 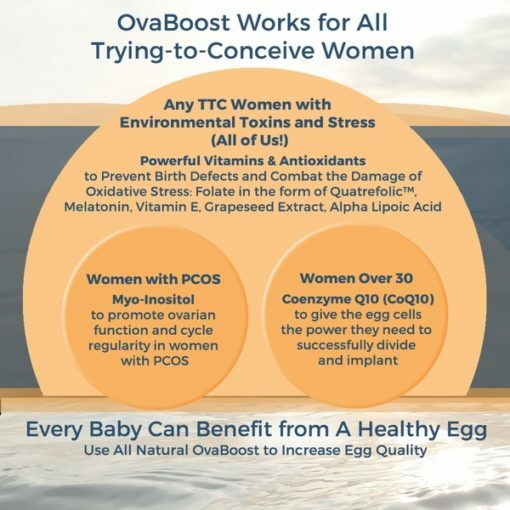 OvaBoost contains a small amount of melatonin, similar to the amount given to trying-to-conceive women in clinical trials looking at the benefits of this natural ingredient for improving egg quality. When taken in the recommended dosage, we do not expect OvaBoost to impact your sleep cycle, or your day time energy levels or alertness. 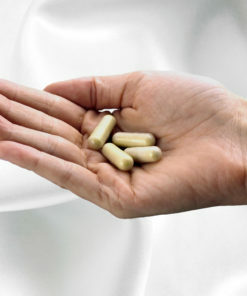 We do recommend that you take all capsules just before bedtime. Have the levels of melatonin in this product been proven to be safe for trying-to-conceive women? 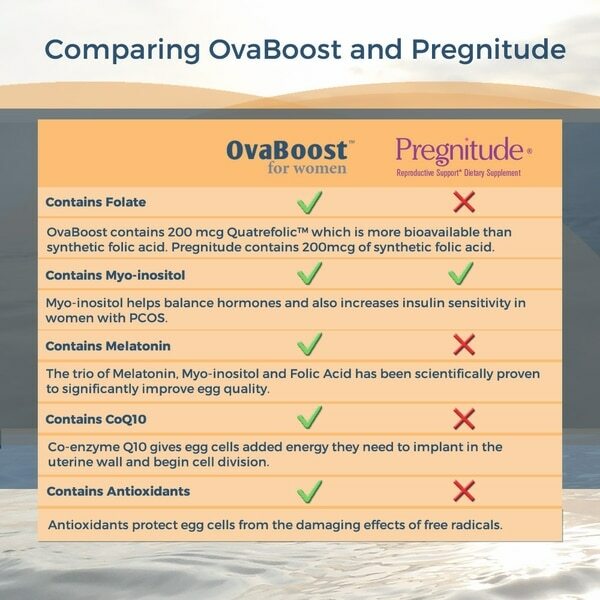 The amount of melatonin present in OvaBoost is commensurate with the dosage levels shown to be safe and effective for the purpose of improving egg quality in human clinical trials involving women undergoing in-vitro fertilization. Because the ingredients in OvaBoost are intended to aid conception and are not required during pregnancy, we do recommend that you discontinue using OvaBoost once pregnancy is confirmed. I have PCOS. Will OvaBoost help me? 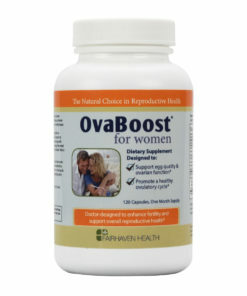 OvaBoost contains myo-inositol, which has been scientifically proven to improve insulin sensitivity in women with PCOS. Because many women with PCOS have cells that are resistant to insulin, these women tend to have higher than normal levels of insulin circulating in their blood. And, for some reason that is not yet well understood, high levels of insulin cause these women to produce higher than normal amounts of male hormones, such as testosterone, which impact the ability of these women to ovulate and menstruate normally. 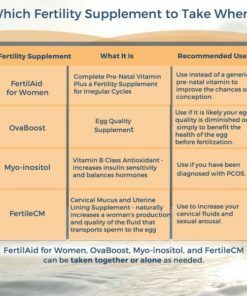 Many fertility experts believe that by supplementing with myo-inositol, insulin sensitivity is improved, hormone balance is restored, and fertility is increased in women with PCOS. I don’t have PCOS, but I have been told my egg quality is poor. Can I take OvaBoost? 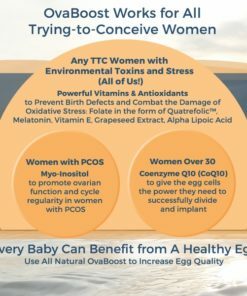 Yes, OvaBoost is intended to help improve egg quality in all women who are actively trying to conceive, whether or not they have been diagnosed with PCOS. 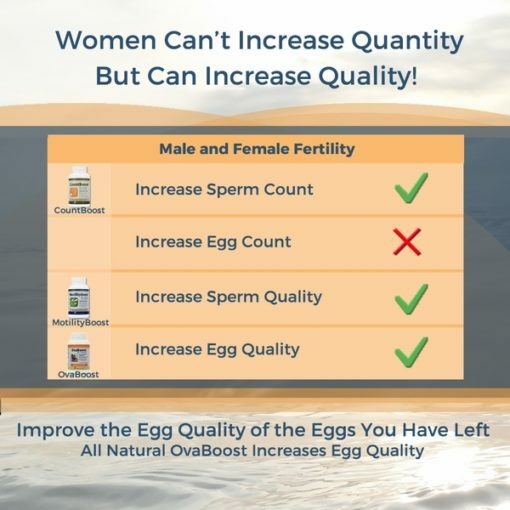 OvaBoost was formulated by a team of medical experts to include only those natural ingredients that have been best demonstrated in the scientific literature to improve egg quality and ovarian function. 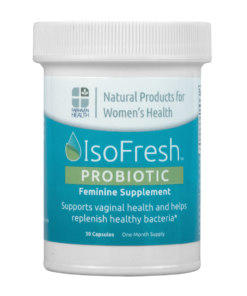 This product is manufactured by Fairhaven Health, a trusted leader in the field of reproductive health, in the United States in a GMP-certified facility. What type of COQ10 is in this formulation? Is it ubiquinol or ubiquinone? Read Daily Mom’s blog review of OvaBoost. I had a history of 2 miscarriages ( both at about 5 weeks) the doctors had no explanation of why I had them. I was hurt diagnosed with anything. But now I’m 4 months pregnant and I have to give all the credit to God ,this product, and fertile cm. But 1st let me start with the negatives; it did make me very sleepy so i took two in the morning right before work and two at bedtime. Sometimes I would take all 4 at night on the weekends so I wouldn’t sleep during the day. I did get headaches sometimes and my stool did get much softer at times. Positives; I felt no cramps and I got pregnant within 1 1/2 to 2 months of taking these products and honestly I forgot to take the required dose at times or I would forget to take the pills everyday. I tried to drink as much water as I could which was hard because I’m not a water drinker. I say all this to say THESE PRODUCTS WORK! even with me not fully following the directions I still got pregnant! Now I’m using their prenatal peapod collection. I will definitely come to them when we try for baby #2 ! Wonderful news – great to hear you were able to conceive #1 successfully, and we’ll be here for you when it comes time for #2…! All our best to you. Wow – congratulations! 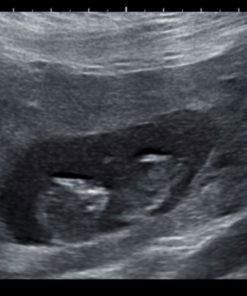 What wonderful news after 9 long years of trying to conceive. Wishing you all the best in your pregnancy and beyond! I started taking this product few months back, but I am very confident we will get the expected results. Thanks for sharing your experience with OvaBoost. Please keep us posted as to your progress, and all our best to you! We have been trying for more than a year,All the tests are ok for both of us. I started taking ovaboost month ago, I always had regular periods but after taking ovaboost I had my period after 17 days! Now I confused if I should keep taking it or stop. I started taking ovaboost thinking it would help!! I started on the first day of my cycle, 4 tabs per day. 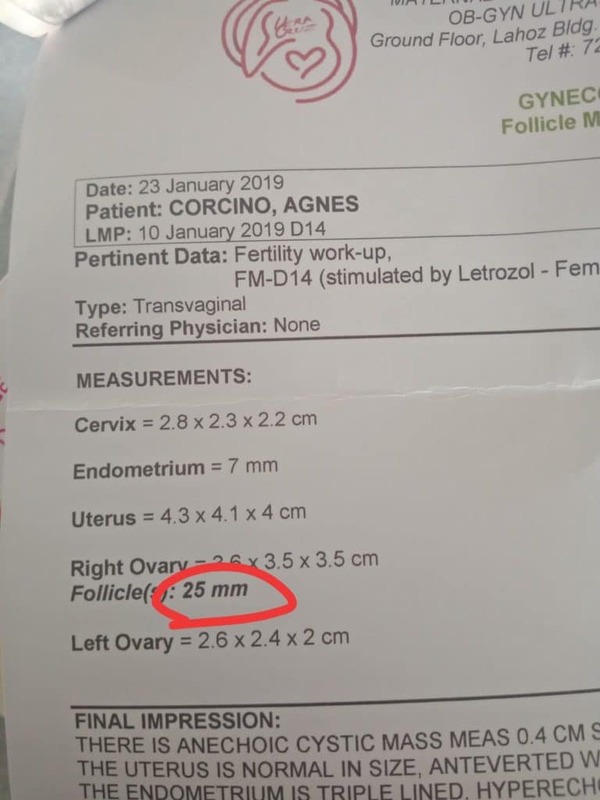 It was my very first time to have a wonderful 25mm egg!! Im so happy, to think that it just my 1st month to try! will keep on using this! lovin it so much! Ah, this is great news! Thanks for sharing it with us – hope you get the result you’re looking for here shortly… keep us posted! Thanks for sharing your experience with OvaBoost. 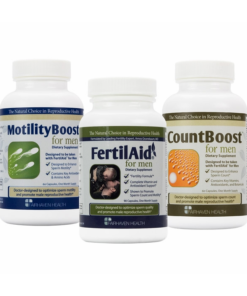 The ingredients are indeed helpful when trying to conceive. Hope you see the result you’re looking for soon – please keep us posted. Thanks for sharing your experience with OvaBoost. Hopefully we’ll see your cycle restore regularity coming off the failed IVF attempt; we would not expect OvaBoost to disrupt a regular cycle. Please keep us posted as to how things go over the next few months. Wishing you all the best! 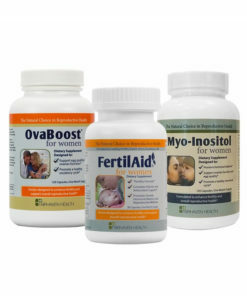 Glad to hear you’ve resumed ovulating with these products, Krystle, and particularly in light of the PCOS. Best of luck to you! In Nov 2015 I had a miscarriage it’s been two years I been trying to get pregnant in Oct 2018 I bought the ovaboost in Nov it will be my second month hopefully I get pregnant . We hope so as well, Inez. Thanks for sharing your story – please keep us posted!